You may remember in a #WebsiteWednesday post about a month ago we featured HYPERLAB.xyz, the Malaysian company using Artificial Intelligence to revolutionize customer service and advertising in the rising startup landscape of Southeast Asia. What you might not know, however, is that one of the main tools HYPERLAB uses to assist their clients also has its own .xyz site and it’s own story to tell: Dialex.xyz. HYPERLAB provides various A.I. services for companies in Southeast Asia to optimize their customer support and advertising outreach, with interactive robot systems that can handle anything from educating customers on health insurance plans to fielding prospective client questions right from an online ad. But to really understand how impressive this system is, you need to learn about the tools HYPERLAB uses. And Dialex.xyz is one of the most unique, as it understands different dialects and even recognizes spelling mistakes, so unlike other A.I. services it can read that text and give a correct response. “Dialex is a core component of our conversational artificial intelligence platform that helps us process scrambled and nuanced dialects into text for better machine learning. We also noticed that there is a distinct lack of resources for Southeast Asian dialects like Bahasa Malaysia and Bahasa Indonesia, so we released Dialex to give data scientists and programmers better access to these kinds of tools. The ultimate goal for dialex is to be a powerful developer tool to process and analyse text in every Southeast Asian language in the near future. 65,000 students (Gen Z’ers) will be graduating over the next few years in the region with the skills needed for future AI roles and another 2-3k in the workforce now (Gen X-Y) are expected to complete online courses that also give them the skills. 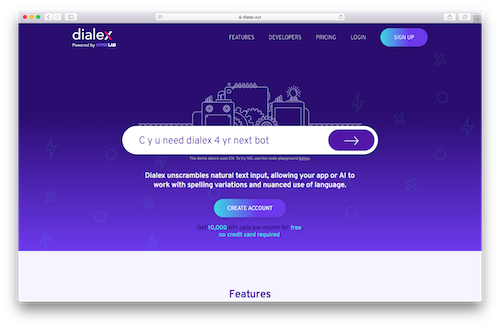 Dialex is built to empower these developers, who are looking specifically into conversational AI. It’s clear that technology is not the only thing HYPERLAB is on the cutting edge of, as they also know investing in #GenXYZ’s talent provides the brightest future for any business. And by keeping consistent branding with their microsites, like Dialex.xyz, HYPERLAB is able to reach the #GenXYZ market with the only domain made for them.